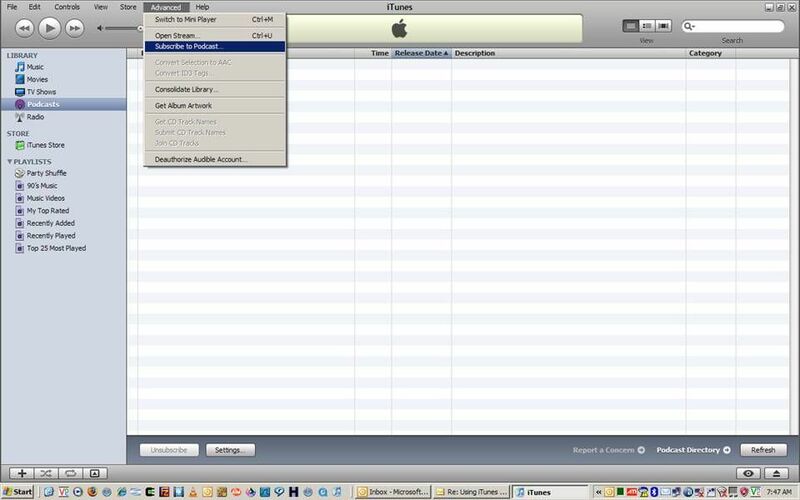 Once installed, launch iTunes from the icon that was placed on your desktop. 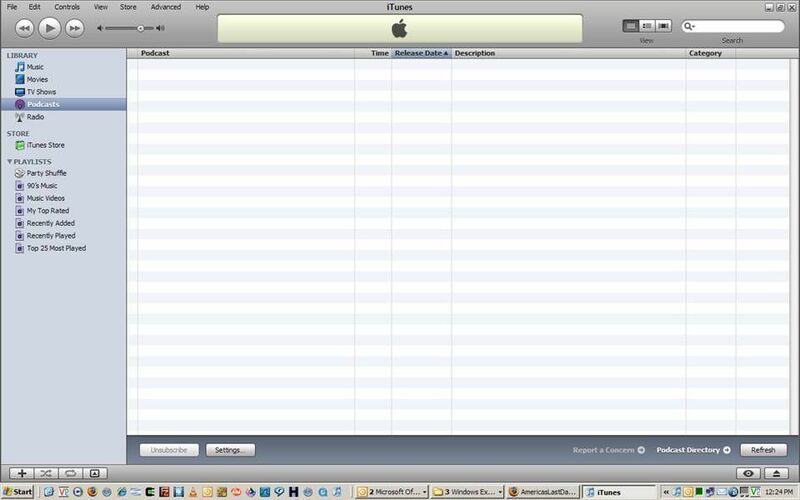 Once iTunes is opened you should see the following (please note that this tutorial was created on a PC; therefore, a Macintosh screen may look a little different). 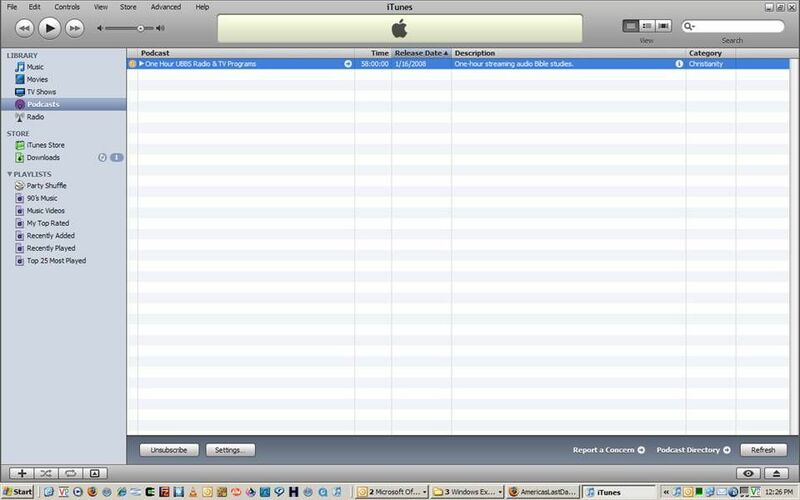 If you would like to move your iTunes library to a new computer, read this tutorial. 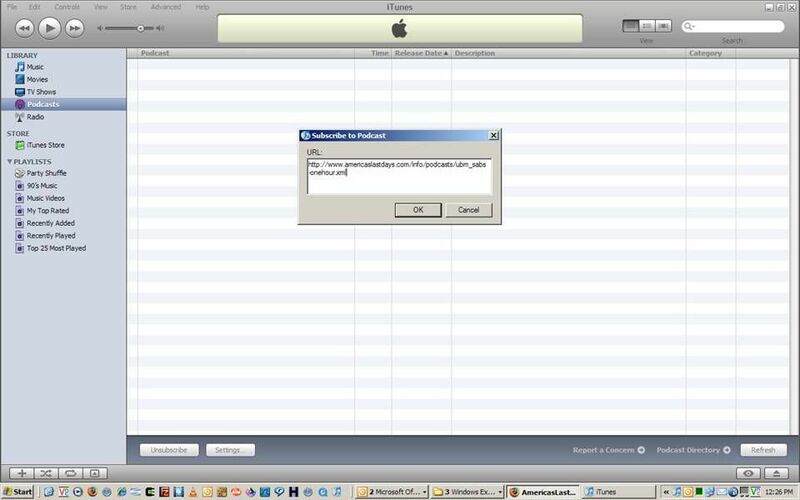 You'll need to copy and paste the URL, such as http://ubm1.org/info/podcasts/ubm_sabs-onehour.xml, into the "Subscribe to Podcast..." field which is located under the "Advanced" menu as depicted below. Click on the "Subscribe to Podcast..." and enter the URL, such as depicted next. Once you have pasted the URL into this box, hit the "OK" button and you will see your new Podcast start to synchronize information. After iTunes has read the information about the Podcast, you can click on the little triangle just to the right of the first column to expand the list of available MP3s with which to synchronize. Then you can click and "Get" individual items OR you can click the "Get All" button where the main title of the Podcast is -- this will get all of the associated MP3 of that particular Podcast. You can also tell iTunes how you want it to handle new updates that are added to our UBM Podcast(s) by going to the following menu path: "Edit > Preferences > Podcasts"
You then can tell iTunes to check for new episodes (i.e., mp3 studies) every day, hour, week or manually; you can also tell iTunes what to do when new studies are available, such as: download the most recent one, download all or do nothing. Finally, you can tell iTunes what to do with the episodes under the "Keep" pull-down menu. Also, you may notice that when the Podcasts are downloaded, they aren't necessarily in the proper order - this is where playlists come in; after you have subscribed and downloaded all the associated files, you can import the playlists listed under the column "Playlist links" to force a proper order. Unfortunately, this is the only consistent way to order the Podcast lists. Please check out our main Podcast page for more information about creating your own playlists. 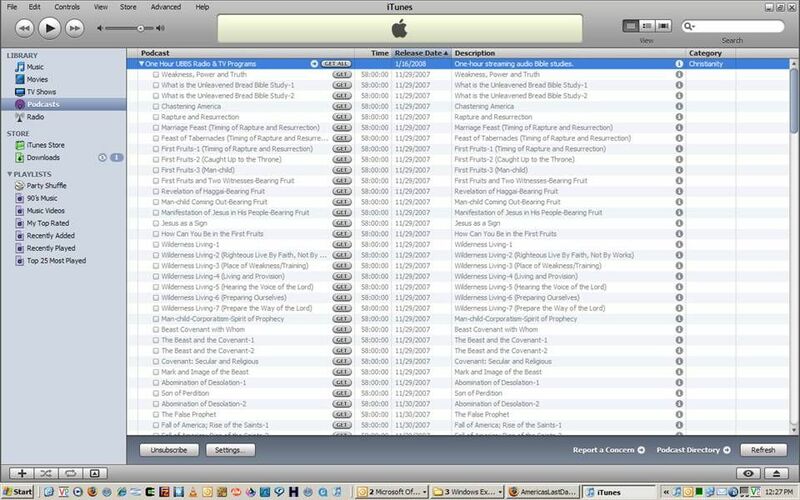 This is just a quick overview of how to get things going using iTunes with the UBM Podcasts. Of course, it is helpful to read the iTunes help information to get better acquainted with how to use the tool and Podcasting in general.